Directions: The William T. Sherman Historical Marker [ Waypoint = N38 37.716 W90 11.330 ] is a brass plaque located on the brick pillar in the northwest corner of the intersection of Locust Street and Broadway in St. Louis, Missouri 63102. It's a short walk of two blocks from the Berthold Mansion tour stop to this tour stop. Stay on Broadway as you cross over Olive Street. Stay on Broadway as you cross over Locust Street. 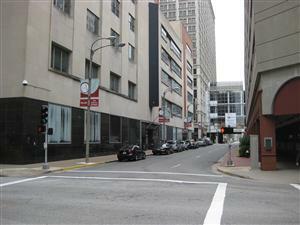 Stop at the corner of Locust and Broadway. 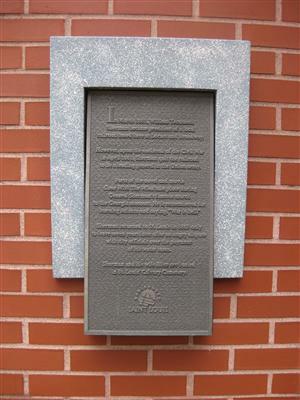 The plaque should be on the building just to your left. In March 1861, William Tecumseh Sherman became president of a local railroad based here at Locust and Broadway. 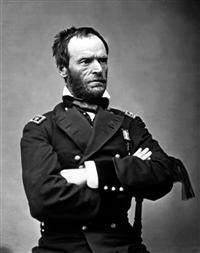 However, upon the outbreak of the Civil War in April 1861, Sherman quit the railroad to become a leading general in the Union army. 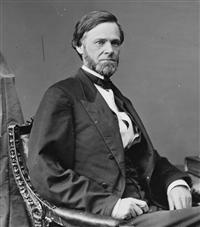 Sherman returned to St Louis in 1883 only to leave seven years later after an angry dispute with city officials over the payment of his water taxes. Sherman and his wife Ellen are buried in St. Louis Calvary Cemetery. You, you the people of the South, believe there can be such a thing as peaceable secession. You don't know what you are doing. I know there can be no such thing . . . If you will have it, the North must fight you for its own preservation. Yes, South Carolina has by this act precipitated war . . . This country will be drenched in blood. God only knows how it will end. 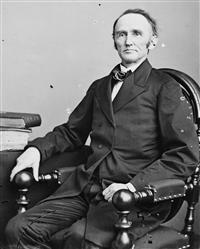 Perhaps the liberties of the whole country, of every section and every man will be destroyed, and yet you know that within the Union no man's liberty or property in all the South is endangered . . . Oh, it is all folly, madness, a crime against civilization. You people speak so lightly of war. You don't know what you are talking about. War is a terrible thing. I know you are a brave, fighting people, but for every day of actual fighting, there are months of marching, exposure and suffering. More men die in war from sickness than are killed in battle. At best war is a frightful loss of life and property, and worse still is the demoralization of the people . . .
You mistake, too, the people of the North. They are a peaceable people, but an earnest people and will fight too, and they are not going to let this country be destroyed without a mighty effort to save it. Recent events foreshadow a great change, and it becomes all men to choose. If Louisiana withdraw from the Federal Union, I prefer to maintain my allegiance to the Constitution as long as a fragment of it survives; and my longer stay here would be wrong in every sense of the word. 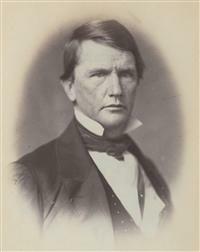 I have quite a largo family, and when I resigned my place in Louisiana, on account of secession, I had no time to lose; and, therefore, after my hasty visit to Washington, where I saw no chance of employment, I came to St. Louis, have accepted a place in this company, have rented a house, and incurred other obligations, so that I am not at liberty to change. Within the arsenal wall were drawn up in parallel lines four regiments of the “Home Guards,” and I saw men distributing cartridges to the boxes. I also saw General Lyon running about with his hair in the wind, his pockets full of papers, wild and irregular, but I knew him to be a man of vehement purpose and of determined action. I saw of course that it meant business, but whether for defense or offense I did not know.